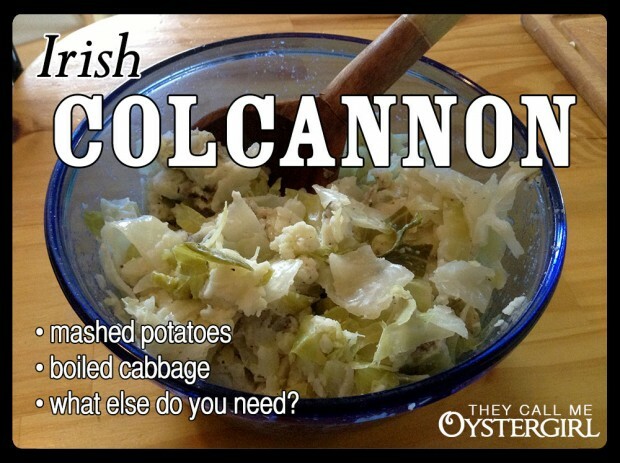 I originally learned how to make colcannon from Irish movies. “Learned” is a strong word. Basically, I found out there was an Irish dish that consisted of mashed potatoes and cabbage. When I made it, people would say, “Why is this so good?? What’s in this?” I would tell them the ingredients, which they hardly believed: potatoes, cabbage, salt, pepper. That’s it. I have since learned more traditional, regional variations (which I’ll tell you about at the end of this post), but I always go back to my original, very simple recipe. 1. Boil the potatoes until they’re soft. Actually, I usually just microwave them now. I know, I know. But sometimes I like to take the easy way out. Chop them up so the skin pieces aren’t too big. 2. Coarsely chop the cabbage, then boil it with salt and pepper until it’s soft. 3. Mash the potatoes, after adding anything extra you might like (this time, I added cream and garlic powder). I like them more smashed (chunky) than mashed, but that’s totally subjective. 4. Strain the cabbage, then add it to the potatoes. 5. Mix it up. Eat it up. Traditional variations include the addition of poached leeks, scallions, onions, chives; using kale instead of cabbage; adding mace (a nutmeg-like spice). Malachi McCormick’s Irish Country Cooking taught me to add a layer of cheese, then bake it. I recommend all these variations, and hope you’ll share your own! I love Colcannon, and I haven’t made it in so long! Guess what’s for supper Sunday- Thanks for reminding me. I’d be curious to hear how you make it and how it comes out.